It seems a good idea to roll all my reports and questions into one thread rather than posting a bunch of threads. One ball of string in the kitchen drawer rather than short little pieces of string all over the house; one clump of mycelium rather than a bit of hyphae here and there. To start, here are my four quart jars: two WBS inoculated March 16 (24 days ago) and two rye inoculated March 25 (15 days ago). All pictures are of just one side of each jar. As you old timers know, there's a lot of variability from one jar side to the next. Some jars are completely colonized on one side and partially colonized on another. I took pictures not of the best side of each jar, but the side that best represents the whole. I can upload more pictures if that would help. All jars were shaken four days ago. 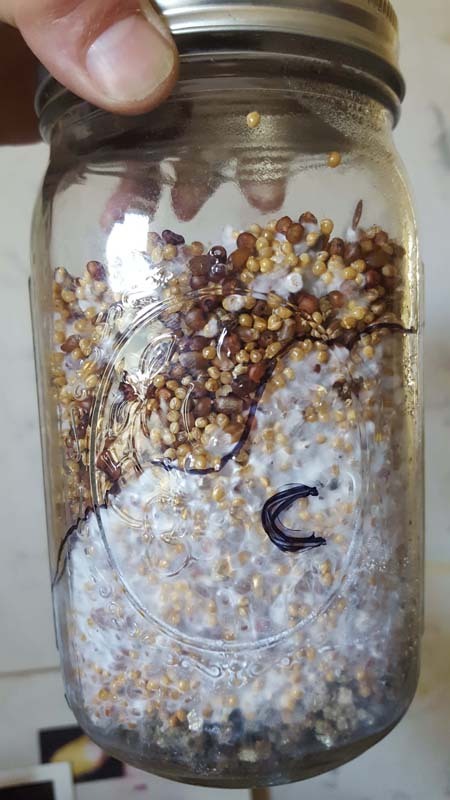 Rye Jar A is about 85-90% colonized. 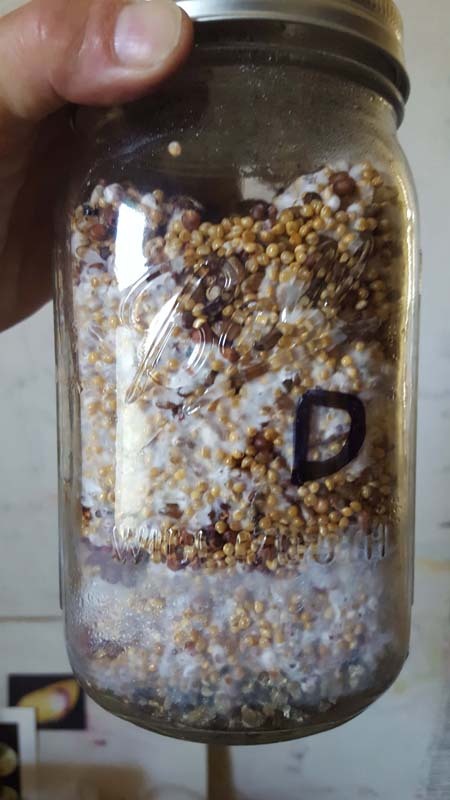 Rye Jar B is about 60% colonized. It was so solid that when I shook it, the colonized part at the top barely budged, and separated from the uncolonized part at the bottom. Now there's something of a space barrier between the two parts, with two dime sized bits of mycelium in the lower part. I probably should have shaken it sooner. WBS Jar C is about 70% colonized. It occurred to me this morning to draw a line along the mycelium edge to monitor growth. WBS Jar D is about 60% colonized. I plan to use 6 quart shoe tubs with coir and either coffee grounds or horse poo. 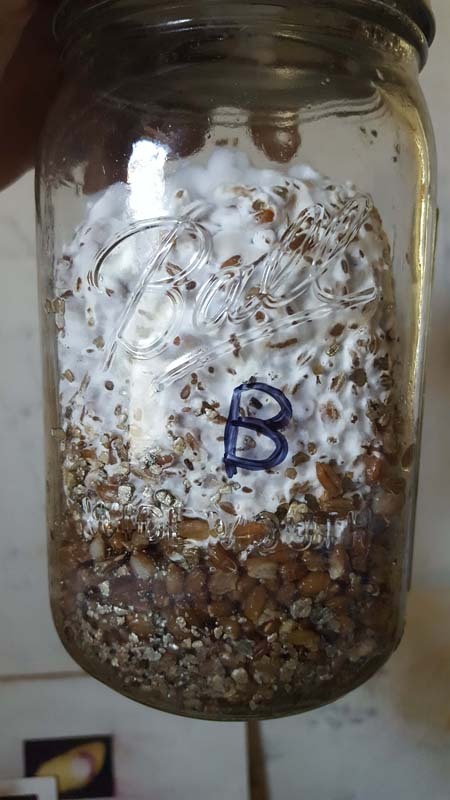 * Does this long uneven incubation use up the nutrients in the grain in the fast parts while the slow parts catch up? * How close am I to moving each of these to a shoe tub? * How many quarts of mycelium per shoe tub? I think the ratio is 1 mycelium to 2 coirPoo? * The water where I live is generally alkaline. Should I use old coffee grounds to add a bit of acidity? * I will be away from home April 20-April 30, and again May 18-June 17. Even if my jars are ready to go into tubs, should I postpone growing until I'm home? * If I do have to postpone growing, do I just put the jars in the fridge to put them into hibernation? No. It doesn't eat much while its colonizing. 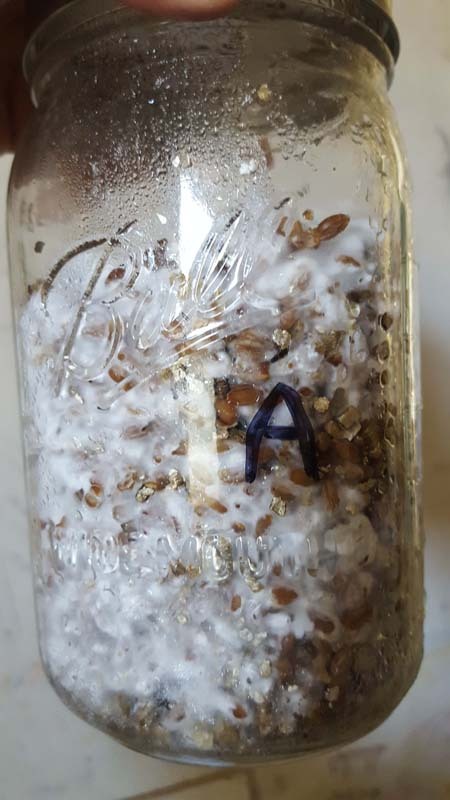 During colonization the mycelium identifies food sources and begins manufacture of enzymes to digest them. Its ready when its ready. Maybe a week, maybe 10. Can't really predict that with accuracy. At least one quart, with 1 to 3 quarts substrate. Its doesn't need to be exact. You just want to end up with 2.5 or inches of depth. On your first grow, I wouldn't use poo. Or coffee grounds for that matter. Acidic conditions encourage mold growth. Coffee grounds plus rich poo need really goo pastuerization or its just inviting contamination. Can't say what to do about being away. Sounds like you picked a bad time to start a grow. But, colonization spawn may do fine refrigerated. Even if I PC the hell out of it? That'll make it more prone to contamination! I'm pretty sure I'm ready to make the move from the quart jars to 6 quart tubs. I need a small clarification though. 1. 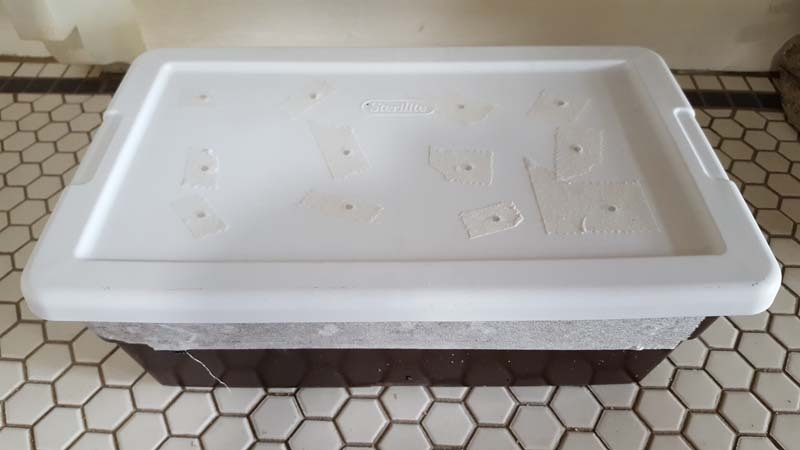 On the bottom tub there is SIX, 1 inch holes, 3 drilled on each side of the lower tub, at the level of the substrate. This is so Co2 can escape - and not build up (which can cause stunted or no growth, learned this the hard way). 2. On the top tub there is one hole for fresh air exchange. Drill just ONE, 1 inch hole in the very center of the top – this is for fresh air to come in and push the Co2 out the bottom holes. 3. Stuff all holes gently with POLYFIL material; don’t use a whole bunch, just as much as needed to fill the hole. 4. Now tape the edges where any excess air might be able to escape. 5. Snip the plastic edges of one side and fold back the plastic so you can attach an office clip to hold the top in place. 6. Use a strip of duct tape to form a hinge on the back end of the tub. This way you can remove the tape around the edges and just flip the lid back when harvesting, also it helps keep things in place. The instructions to make these drilled tubs come in the beginning of Step 8, so I'm a little confused. Does one make the tubs at the beginning of Step 7: Spawning To Your Bulk Substrate Mixture? Or not until you're ready to induce pinning? My guess is that I do the drilling before I put the spawn and substrate into the tubs, and cover the holes with duct tape that gets removed when it's time to initiate pinning. I'm buying coir and tubs today. That tel is kind of vague as to purpose. You benefit from gas exchange at substrate level. You want holes of some fashion just above the level you're going to fill your tub too. 6 1 inch holes is probably too much. Drop those to half inch. I like smaller holes, but more in number, 1/4 inch or less, roughly an inch apart, covered with micropore. Stuffed with polyfil or covered with micropore tape. Don't cover anything with duct tape. You only need make the bottom tub first. Spawn it, pop the lid on and let it go till you see pins or at least hyphal knotting. Then add your top tub. The size of the isn't critical, you want enough holes to allow gas exchange, but still maintain humidity. Too much, and it dry out, to little may slow growth and encourage contaminates. Its common to take a couple runs to get a happy medium. You'll learn what works and adapt. I don't do any fancy clamping or hinging. When I add the top I just add a bit of micropore to 2 or more sides to hold it place. Doesn't need to be sealed or a perfect fit. Thank you so much Dethy dear! So no holes in the lid at all, and gas exchange (micropore tape over the holes you described) is OK during pre-pinning incubation,right? Breaking news! Rye jar B has pee (I know, it's metabolite, not urine). And what I think might be hyphal knots in the quart jar (they're not as fuzzy as the rest of the mycelia). 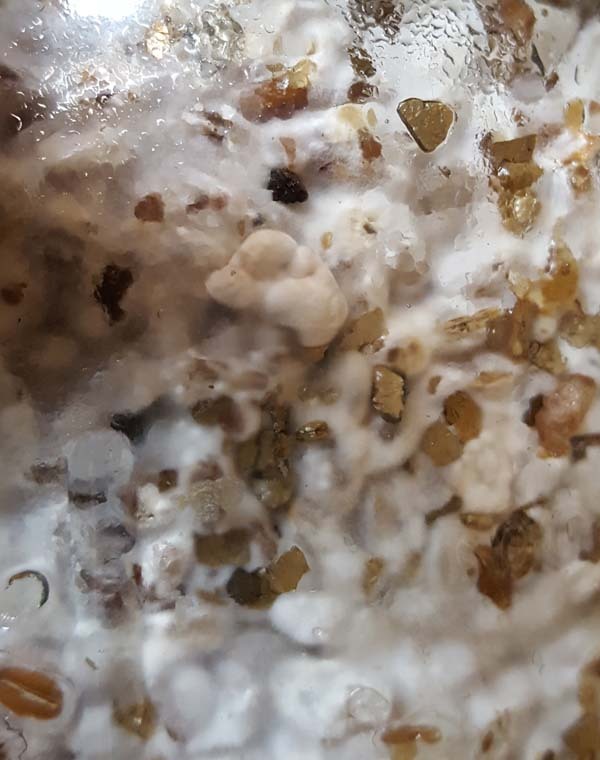 Are they hyphal knots/primordia? After much reading, I think it's OK to refrigerate my jars so I can spawn them to substrate after I return home in mid June (I'm leaving in a week for 10 days, home for 16 days, and away again for a month). I think I'll go ahead and spawn to substrate Rye Jar B now, since it seems to be an early bloomer. I'm a n00b, so I'm pretty self-forgiving if this one jar goes south. The lid I usually do make a bunch of small holes in, 1/8 inch and cover with micropore. Is this true? About opening it every day to wipe out condensation? "After spawning to your bulk substrate, in your 6 qt shoebox, place the lid back on the box (the lid that came with the 6qt shoebox). Now we want to place this finished tub into your incubator for 5 more days. Every day you must check your shoebox and remove the lid, wiping down excess water that has collected on it. By day 5 it should be about 85% colonized. This is when I start the pinning process"
It seems like other TEKs out there say DON"T PEEK! Its all myth and legend. You don't need to wipe out condensation. It is a good time to just leave it alone a while. As long as you have some holes for gas exchange, and the substrate is nicely hydrated you shouldn't to do anything for week. Seeing some condensation in there is normal, and a good sign. I'm lazy. I'd check on it, probably wouldn't do anything till pins push the lid up. Then I'd just put the top on it.